Mumbai: Infosys Ltd’s American Depository Receipts (ADRs) fell over 4% in early trading on the New York Stock Exchange. Investors are evidently unhappy with the company’s June quarter results. On the face of it, things seem steady at the company. Infosys retained both its revenue growth and profit margin guidance for the year. But underneath the surface, it is a different story. Revenues grew by 6% year-on-year in constant currency terms last quarter, lower than the 6.4% growth reported in the March quarter. Remember that nearly all IT stocks have risen this year on the hope of acceleration in growth. Infosys’s numbers aren’t supporting the theory yet. What’s more, the key financial services vertical reported a marginal drop in revenues sequentially. So although the company sounded gung-ho about the prospects for this segment, based on deal flow, it doesn’t yet have the numbers to back up its optimism. In contrast, Tata Consultancy Services Ltd (TCS) reported an over 200 basis points improvement in growth rate last quarter vis-à-vis the March quarter. And the financial services sector, which grew 3.7% sequentially, had a good deal to do with this. 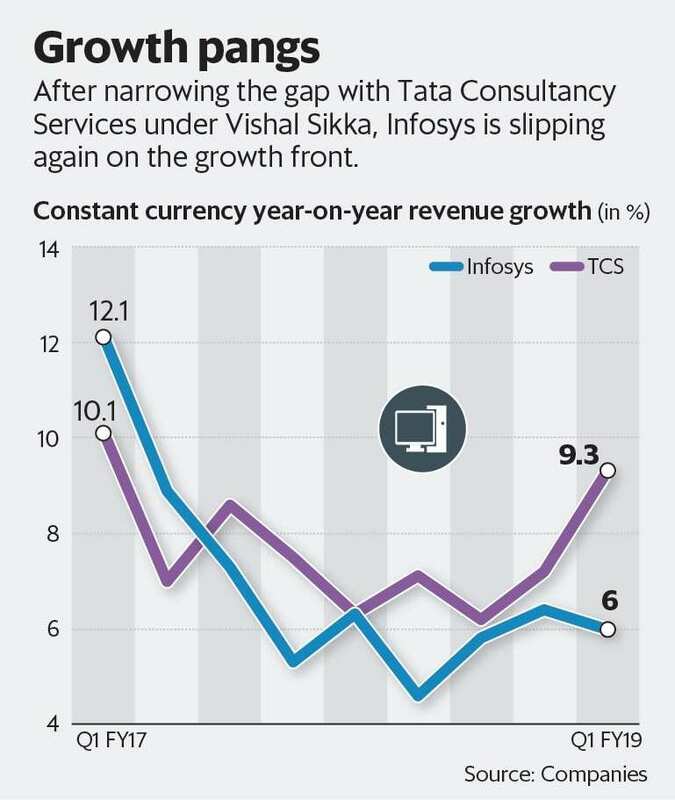 As things stand, TCS’s growth this year could be 3-4 percentage points higher than Infosys’s. The gap between the two is widening, after having narrowed when Vishal Sikka was at the helm at Infosys (see chart). In fact, this was another reason IT stocks have rallied lately—the expectation was that the depreciation in the rupee would boost profits. Again, this thesis isn’t supported by Infosys’s guidance. It appears that it will reinvest gains from the currency back in the business to drive growth. As such, any increase in growth rates will come at a sizeable cost. Another worry is the simultaneous rise in both employee utilization and attrition at Infosys. To start with, a jump in attrition at a time when the industry is growing in single-digits is unusual and worrying. It’s not like there are opportunities galore in the industry. Besides, utilization rates have reached record highs of 85.7% excluding trainees, which means the company doesn’t seem to have much of a buffer if there are unexpected growth opportunities. It is either unexcited about growth prospects or, worse, blindsided about growth opportunities. Either way, the messaging is poor as far as investors are concerned. So while the company’s post-results commentary focused on a pickup in new deal wins and a healthy deal pipeline, the fact that hardly any of this is reflected in the June quarter financials is naturally worrying some investors. The writer does not hold any positions in the companies mentioned above.